Buenaventura Golf Course All Rights Reserved. With large bent grass greens, coupled with emerald fairways, Buenaventura Golf Course is one of the finest municipal courses in the Southland. A William Bell design originally opened in 1932, Buenaventura underwent a $6.5 million dollar renovation led by Forrest Richardson in 2004, including complete re-routing of the golf course and new playing surfaces, and re-opened in March of 2005. With subtle undulations and contours, all the greens have been re-sculpted using classic Bell designs. Beautiful mature trees line Buenaventura’s green fairways, while white sand bunkers border the greens. The design enhances the parkland feel that people loved so much about the original Buenaventura. The hazards look like they were not merely manufactured, but rather discovered in the landscape. Among the many considerations for the redesigned course, safety, playability, strategy and variety all played key roles in the development of the new design. In 2012, KemperSports identified a need for further upgrades to playability and consistency of the turf and that spring, platinum paspalum fairways were added, creating the beautiful golf landscape you will find today. 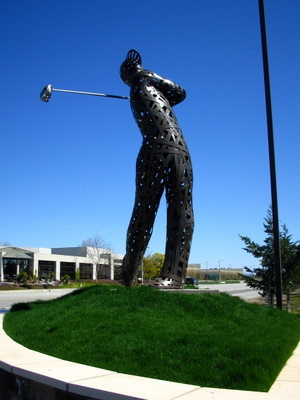 "The Big Swing", by Michael Stutz, a 12' tall figurative sculpture made of bronze strips intricately woven and then welded together, depicts a golfer who has just hit a powerful drive. The work adopts Stutz's quintessential style of heroicizing figures from everyday life with his remarkable woven bronze technique. Get the latest news and specials from Buenaventura Golf Course.